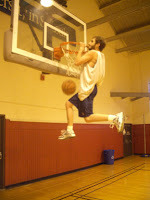 Below is part 2 of our conversation with NBA draft hopeful Zach Feinstein, information on whom can be found at his website www.DraftFeinstein.com. Hugging Harold Reynolds: You have noted your physical likeness to Herm Klotz, who from the NBA do you most resemble mentally? Zach Feinstein: Mark Cuban - well you never said it had to be a player (if you hadn't noticed I am a fan of loopholes). HHR: Are you prepared for your future role as absentee father of several dozen children and how will that affect your free throw percentage? ZF: I feel this would never happen to me because I have followed the off-court experiences of Shawn Kemp and Karl Malone. As for my free throw percentage, well that can only go up. HHR: Is this all a ploy to get closer to Erin Andrews? If so, Bravo good sir. ZF: Which answer would get me the interview with her? HHR: I swear to God this is true: when I played youth Rec League Basketball I was terrible and frighteningly short. Somehow I managed to grab a rebound and took a shot and made it. Into my own team's basket. The only basket I made all year. What is your most memorable/emotionally scarring basketball memory? ZF: Whoever said "sticks and stones may break my bones, but words will never hurt me" obviously never got trash-talked after missing 20 shots in a row. HHR: How is important is it for you to go No. 1 overall? ZF: Not very, the site isn't draftfeinsteinnumber1.com. HHR: What do you think you'll bring to a franchise as far as marketability? ZF: Since I am at the size and skill level of the average fan, I can make a team appear more fan friendly. I'm rather certain this: 1. is not a question and 2. in multiple ways does not apply to me... but I like the comparison to Greg Oden since neither of us played any basketball this year. HHR: How do you feel about being compared to Tracy McGrady? ZF: I feel good about it, seems reasonable, we both have won the same number of playoff series. HHR: Is it true that whichever sneaker company you sign with, you want your shoe to be moderately priced? ZF: I would not only want that, but demand it. Unless of course the deal is with a maker of driving shoes, then I might fail in negotiating due to my love of driving shoes. HHR: What's something you learned in college that's going to help you at the next level? ZF: With all the math courses I am taking, I would probably be an asset in statistically analyzing who should get the ball when the game is on the line. HHR: Do you feel the league, as it gets faster and smaller, is leaning a bit more toward your style of play? ZF: If we get rid of that faster part then yes. HHR: Some people have knocked your toughness and level of aggression. What do you make of that? ZF: I want to know the last time they have tried to play a sport against people over a foot taller and 100 pounds heavier.